When I started playing a Nine Hours, Nine Persons, Nine Doors a few months ago, I did not expect it to end the way that it did. I knew that 999 had multiple endings, but I was very surprised when my playthrough suddenly ended with what I can assume is the worst possible ending. Far be it from me to deprive anyone of a similar shock, so I won't spoil that ending here. But, if you're familiar with the "knife" ending, you know the feeling of the feeling that I might have been feeling in the moment that I felt feelings. This brings to mind a topic that tends to come up when I talk about film: the difference between what I like and what is good. Many of the movies that I've enjoyed the most resolve in unexpected and disappointing ways. Take The Curious Case of Benjamin Button for example. During a wide shot of Benjamin riding a motorcycle on some country road, it hit me that there was no way that he would ever be able to share in the human experience. I watched the rest of the filming knowing that there would be no happy ending, and I shared some of the protagonists sadness. It was uncomfortable and painful, but it was a cinematic experience that I cherish to this day. Simply put, I didn't like it but it was good. Make no mistake, 999 is in no way similar to The Curious Case of Benjamin Button. However, 999 was able to approach a few moments of emotional resonance surrounding some very unfortunate occurrences. I appreciated my time with the game in spite of the unfortunate end that met. 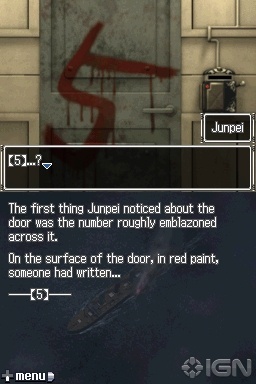 This, of course, speaks to what appears to be Chunsoft's careful execution and craftsmanship. 999 consists of two major components. The primary focus of the game is a tense narrative surrounding 9 persons who have been kidnapped and imprisoned on a ship that is sinking. The group has 9 hours to escape a series of rooms that barricaded by 9 doors with a unique locking mechanism. The premise seems preposterous (and it is), but it makes sense within the context of a surprisingly well written story. It really is like reading (and interacting with) a suspenseful novel. 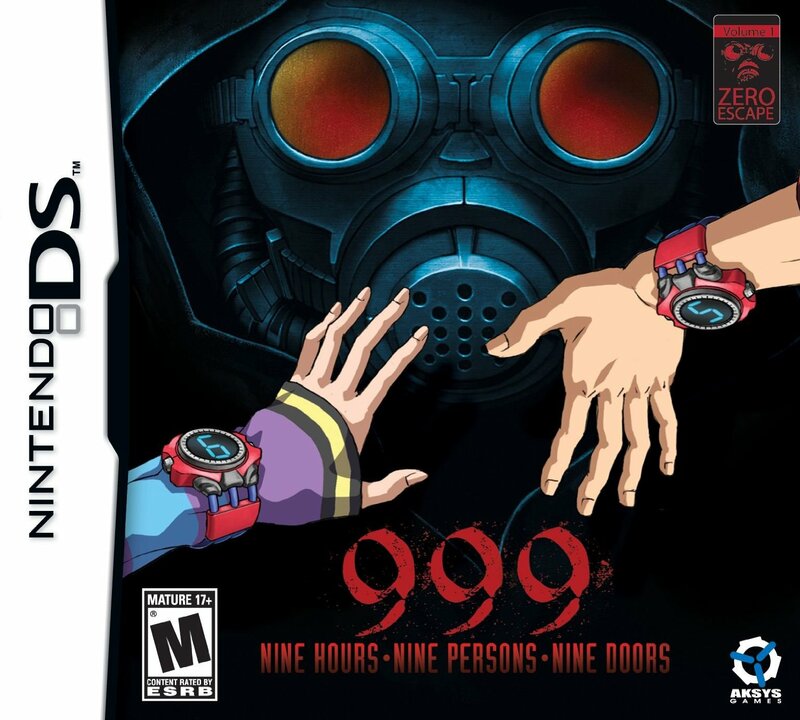 999 isn't just a visual novel, though. It's narrative is paired the point-and-click adventuring that the Nintendo DS is so well suited for. The best thing is that nothing about the puzzles presented in the game is inconsistent with the story. It makes perfect sense that participants in the psychotic Nonary Game would encounter the challenges that they do. There was no point in the game that I felt any dissonance between the gameplay and the narrative. It all fits together to form an interesting—though not always pleasant—experience. Did I enjoy the way my adventure ended in Nine Hours, Nine Persons, Nine Doors? Certainly not. Was I satisfied with the execution of experience? Absolutely. 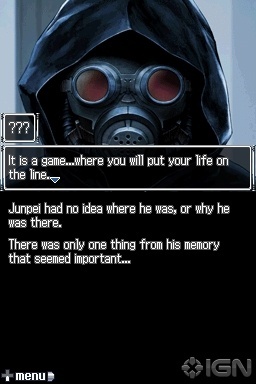 And now, I'm all the more interested in taking 999's advice and re-playing the game. Thanks to the kindness of the developers, I can fast-forward through parts of the game that I've played before, hopefully affecting the events of the game to end a little more favorably next time. 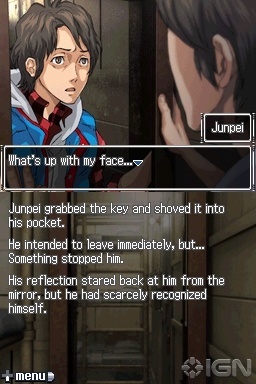 We can do this, Junpei!